Underwater wet welds pick up hydrogen from the surrounding water. Hydrogen is detrimental to weld metal integrity because of HAZ cracking and weld metal microfissuring. Methods to minimize hydrogen pickup include flux composition modification and hydrogen gattering. Oxidizing fluxes with adjusted CaO/SiO2 (Basicity) ratios used in this work to reduce hydrogen pickup. 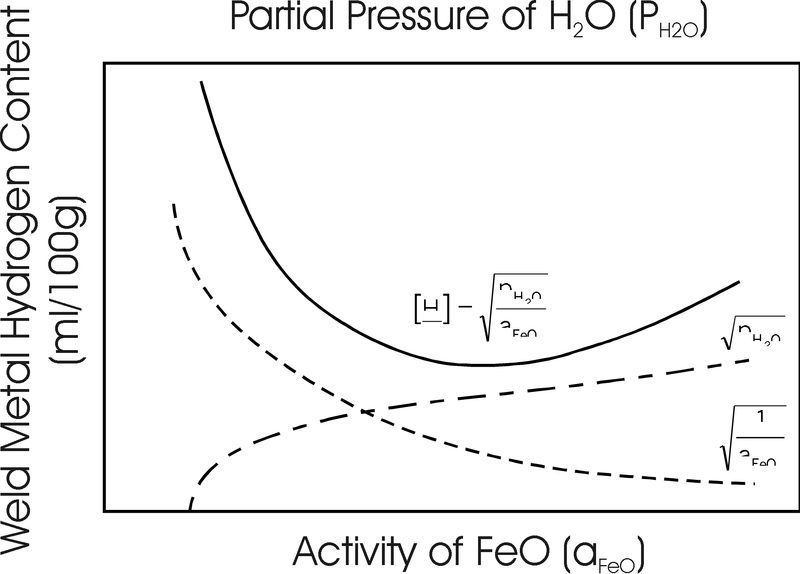 Electrochemical reactions determine hydrogen pickup in underwater wet welds. Both weld metal hydrogen content and slag hydrogen content were dependent on the phases present in the slag. M�ssbauer spectroscopy indicated that Fe+2 was the only valence state present in the slag for the entire range of hematite additions in the electrode coating. Minimum hydrogen (13.2 ml/100g) was obtained with the presence of fayalite (2FeO.SiO2) in the slag. Lower weld metal hydrogen contents were obtained using DCEN (CC-) in wet welding.